And so I can't believe I've never blogged about this before. I keep checking over and over again before I post this, because I feel like I must have shared the photos with all of you, but nope, if I did it was probably in a dream. Which means I must be going slightly nuts and AiClay-obsessed to be doing work even in my dream! Which is probably another story for another day. And here is the pendant I am ashamed to have hidden away for so long. I do like the thought of receiving this in a Christmas stocking, just a piece of Christmas memory encased in a little glass jar. Oh yes, did you notice the panel of tabs at the top of my website? 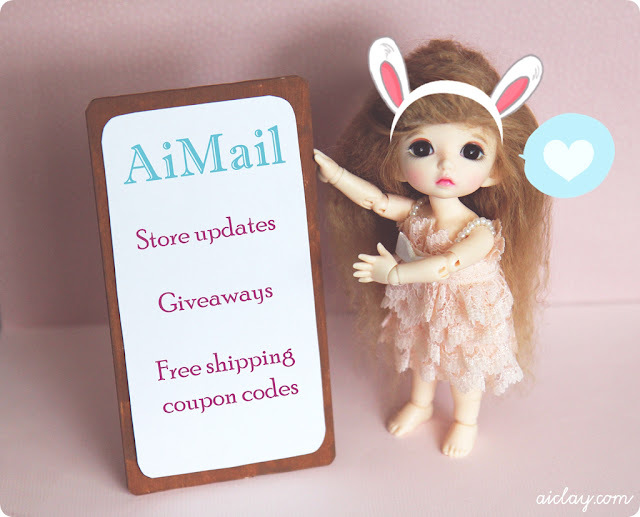 Now you can hop to shop in the shop, find out about workshops available, update about your AiClay order, subscribe to AiMail.. So go click-crazy! Bambi is helping to show off what each issue of AiMail will be arriving with. ♥ It is a monthly issue so do not worry about me bombarding your mailbox, I hate spam as well. All email addresses will be kept hidden from other subscribers. How to subscribe? Just click on the 'Subscribe to AiMail' tab on the top of this website, and leave your email address in a comment there! Alternatively, send me an email to buzz@aiclay.com using your working email with 'I want to subscribe to AiMail' in your subject header. You did ... you did... you did share the photo of ur cookies in the jar. It was on facebook though :)... love it a lot. wencrafting, OHHHH hahah thanks for reminding me! losing track of all my updates everywhere! This is a great idea. The concept of putting a cookie-like thing inside the bulb is such a brilliant one. It's perfect for fashion events. I'd love to get one.